As you all know by now, The Cook Book Guru this month is featuring Saha by Greg and Lucy Malouf. At the beginning of the month, I went through and tagged a number of recipes, including this one. I was keen to make this recipe because we recently watched an episode of Shane Delia’s Spice Journey where he visited Baalbeck. In the show, he took a number of ingredients to the local butcher who chopped and mixed them with meat for the filling. He then took this meat mixture to the local baker who made the little pies for him. This episode reminded me of our visit to Baalbeck, which was filled with drama. We arrived in Zahle, a town on the edge of the Bekaa Valley, with the sole intention of going to Baalbeck to see its magnificent Roman ruins. Our first request, when we arrived at the hotel (the only one in town), was for a taxi driver to take us to Baalbeck. Little did we know what a problematic request this was. The hotelier was on the phone for quite a while before she was able to confirm a taxi driver would take us to Baalbeck but he would only wait one hour. At the time (and unbeknown to us), Hezbollah had been helping the Syrian government out by sending a few bombs the Syrian rebels way so the rebels were sending retaliatory fire back over the Lebanese border to Baalbeck. Ignorance is a virture, as Oscar Wilde so famously said. Our taxi trip there took us through the lovely Bekaa Valley and past horrid camps that poor Syrian refugees called “home”. The trip was accompanied by periodic calls over loud speakers for the faithful to take up arms. When we arrived, we were the only tourists in what is a world famous tourist site. Because we only had one hour, we whizzed through a site that you would want to take a day to see. Whilst we were there, we heard machine gun fire not so far away which was all very disconcerting, to say the least. I have made this dough many times. For a while, it was my go to pizza dough base recipe. The yoghurt gives the dough a lovely chew. I highly recommend it. I have also made the lamb filling for another recipe in Saha, minced lamb pizza, which is the same base and same filling but little pizzas instead of little pies. I must say I wasn’t that impressed with the pizzas. The lamb is spread very thinly over the base, making it very dry when they are is baked. By forming the dough into little pies, the meat was cooked to perfection and remained very moist. It was like eating lovely, moist, lamb meatballs in a bread base – delightful. The labneh and pomegranate molasses added to the complexity of flavours. Very nice indeed. You will note from the photo that my pies are very rustic. This was taking a leaf out of Shane Delia’s book. He said, after watching the Baalbeck baker, that this was the way to go. This sentiment was reinforced by the fact that I took a photo of the best eight, then ate them for dinner, only to discover later I didn’t like that photo so what you have is a photo of the second eight. Oh, well!! Dissolve the sugar and yeast in the warm water. In another small bowl, whisk together the yoghurt and olive oil. Pour the yeast and the yoghurt mixture into the flour. Knead the dough. You can knead the dough by hand for 10 minutes, or in a mixer for 5 minutes or in a food processor for 1 minute. I went for the last option. Lightly oil a bowl and put the dough into the bowl. Cover in plastic wrap and leave for two hours. After an hour or so, put a tile or pizza stone in your oven and preheat your oven to 250°C. Dust a rolling pin with flour, then roll the dough out as thinly as you can. Cut it into 16 rounds, each about 10cm in diameter. Place a spoonful of minced lamb filling in the centre of each round. Moisten the edges of the pastry with a little water, then pinch the corners together to form the traditional shape. Turn your oven down to 200°C. Put a dollop of labneh onto each pie, along with a drizzle of pomegranate molasses. This entry was posted in Lamb, Pies and tarts and tagged Baalbeck, Baalbeck lamb pies, Greg Malouf, Saha, The Cookbook Guru by Glenda. Bookmark the permalink. I love that you are cooking up all those Middle eastern delights. they are hard to make by the way and yours look authentic. What a great story! I think if I’d heard machine gun fire I would have seen it all in about 15 minutes. I’m a wuss when guns are around. These pies sound heavenly and to have one in Baalbeck would be terrific. Hi Maureen, I am bit of a wuss too. It put the shits up me. I love these little lamb pies! Like you, I also use the lamb filling for pizza – drizzled with pomegranate molasses once cooked. Yummy! Boy oh boy do these look scrumptious. I have to say that taxi driver must have had one heck of a craving to drive into all that! It was quite an adventure you had and I’m glad that it was a safe trip. Too much crazy conflict all over and I do feel so sad for those people. My friend’s father came to America in his 20’s many years ago and at his funeral hundreds do Syrians showed up to pay respects. Apparently he had been quite the freedom fighter and had spent much of his life after immigrating to the States helping refugees find homes here. Not many realized how active he had been until after his death. Hi Diane, I feel so sorry for the Syrian people too. I just don’t get religion and why it leads to so much suffering. My stats show you started following 2 days 10 hours ago. Am I turning up in your reader? People turn up in my reader even though I don’t get notification emails. I hope all is well your way. I’m glad you mentioned checking the reader. I’ve got blogs listed that I’ve never asked to follow & although I do have yours listed, when I clicked ‘edit’, I see that you were down as sending new posts = off. I’ve changed that to ‘instantly’ so we’ll see if that sticks. I also noticed some others that I had been followed had been turned off too. I think yesterday I got some email from WordPress that they’ve updated the reader so perhaps they’re like Bill Gates & Windows…it’s a matter of enhancements vs. features. You got me to check my reader, I honestly don’t know what is happening. I get emails from FJ&LC but it didn’t say I was following. Beat that. Well now that I made the change in my reader, I’m getting your posts going through now. I remember something like that happening to John in Chicago where he los about half his readers. I don’t actually think we were in any danger. It was just the circumstances and the fact the machine gun fire put the shits up us, if you appreciate what I mean. Well, thank goodness you returned safely – sounds a bit hairy. I loved the Egyptian pizzas topped with lamb, but like you I found that when I tried to make them, the meat dried out too much so this looks much more better. Have written “lamb” on my shopping list. Dangerous and disconcerting as your trip was – it certainly makes for more than usually interesting travellers tales, Glenda! Apart from the heartbreak of the conflict itself and the desperation of the refugees – it’s so sad when places of such historic importance are over run by conflict and destruction. However, those little pies look and sound delicious – you were maybe lucky to find a gourmand for a taxi driver! Hi Jan Thanks for stopping by and commenting. Sad is not the word. I feel so much for the Syrian people. Worst still, I don’t even understand what is going on and why – I just see pointless destruction. In retrospect, I think you are right Ella. 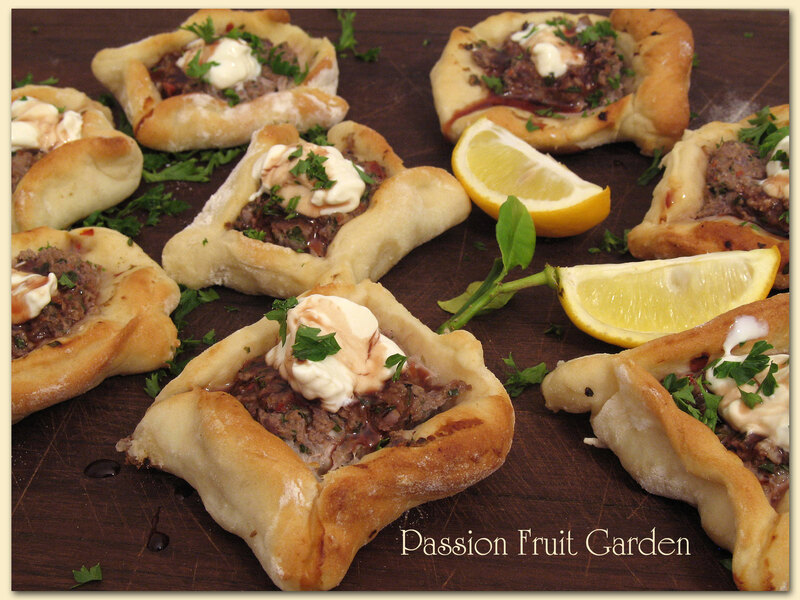 Make sure you check out this wonderful post from Glenda at Passion Fruit Garden, recreating lamb pies from Saha, and talking of her experiences of the real thing from her travels. Thses look so authentic and delicious. The circumstances of your visit to Baalbeck sound a tad nerve racking, but the pies sounds really delicious. I love sharp yoghurt and lamb together. Hi Sandra, the dough would not do for you 😦 though spelt would surely work.